I like the interactive aspect of this. 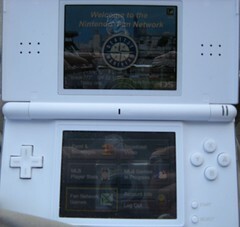 I even like the use of the DS. But for the far-reaching aspects of this technology, I think I would rather see development that could function on more open standards. Don’t get me wrong, I love the DS (hell, I have 2 of them) but I think for this type of thing to go anywhere, it needs to not be locked to any specific hardware, be it from nintendo or any company fond of putting out shiny white pieces of pretty plastic. Id rather each stadium just put out a mobile web app, print a password on the ticket stubs, and go from there. Then everyone with a wi-fi device can (theoretically) access it, DS users included. Regardless of the hardware, I’m all for web interaction being brought out of the office, away from the pc, and into our daily lives.